This beloved classic story is probably best known for its film adaptation, rather than the book it was made from. It could be argued that I am biased about the film since that is how I was introduced to the story in the first place. Without question, a true delight. The way the film was adapted added so much more to the story than even the book, in my opinion. There's not much more I can say about the film, it's essentially perfect. It's kinda funny that today they would probably tag this as a paranormal romance, but I'm sticking with the much more enticing genre title of Gothic Romance. Which leads me to the book. Now I am very familiar with Gothic Romance books, I sell them in my Etsy Shop and they are very popular. This book is simply no more than that, and actually I've read better ones. The book, oddly enough, did not capture the charm and growing affection between The Captain and Lucy Muir that was so evident in the film. Which is remarkable, being the film was made a scant 2 years after the book was written. There are two major differences between the book and the film; the first being that they omitted one of the children for the film. 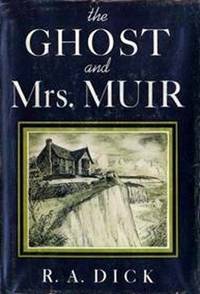 In the book, Mrs. Muir has two children, a boy and a girl, and it's suggested by The Captain that she does not get on well with her male child, who grows up to be a pious student of the clergy. Constantly chastising his mother and sister for their unconventional ways. Pffft. I'll take a sweet and almost non-existent little Natalie Wood over that any day. The other difference between the book and film is the love interest who comes into Mrs. Muir's life about halfway through the story. In the film, this is a minor plot point and nicely handled. In the book, it's a disaster. 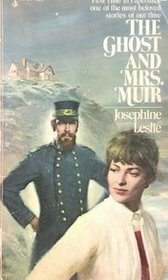 She falls head-over-heels in "love" with this unlikely other man, rather stirring the jealousy of The Captain, even though it was he who put this other man in the path of Mrs. Muir, citing that she should begin a new life and a new love, instead of wasting away as a widow in a remote cottage by the sea. Further in the book, she becomes willing to abandon her children and go off with this stranger, and I just found that whole part really unlikely, not to mention a major disappointment in the character. What woman (in the 40's no less!) would do that? Ain't buyin' it. You may notice there are different author names on the two books shown. This was at the author's, Josephine Leslie, insistence, because she thought a woman's name would lessen her chances of strong sales. Sadly, she was probably right. Fast forward to 1968, and what is old is new again with the TV Series. 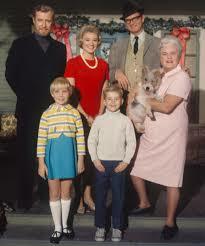 Brilliantly cast, it is your typical sit-com fare for the late 60's, like an oddball cousin of The Brady Bunch. 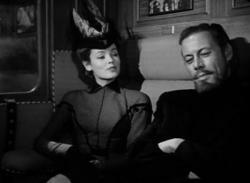 As in the film, the chemistry between The Captain and Mrs. Muir is believable and delightful, you're rooting for a supernatural miracle to truly bring them together. The show lasted two full seasons, which at the time of this writing are available on YouTube and on DVD. Perhaps the network had been hoping for a third season, as the final episode of season 2 is rather ambiguous, but has enough of an "ending" to satisfy.